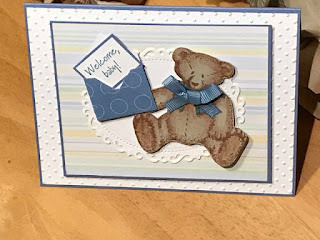 As you can probably tell from my recent posts, I like making cards with fun and creative backgrounds. I think the background of any card is what makes it really special and unique. The latest background technique that I am experimenting with is ink-resist. I made the backgrounds using Versamark ink and clear embossing powder. I like how the details of the stamped image show up so well. I applied the different colors of ink using sponges. I like using sponges because I can control how dark or light I want the color to be. The first image is a sample of the ink-resist background cardstock before I have used it on a card. You can use any color combination that you like. On the sample piece, I sponged on three colors; I used four colors on the background of the anniversary and birthday cards. The background on the anniversary and birthday cards were made from the same piece. Cutting the background cardstock into two pieces allowed me to stretch the use of the background paper and my creativity. What are your favorite background techniques? You can find these cards and many more on my Etsy shop. Exclusive savings for blog readers. Get free shipping on all orders over $20. Using coupon code BlogShip.